When I deliver training, or make a presentation, the majority of my audience is there to learn. Willingly, and gladly. I can tell which ones are: they are the ones sitting forwards, their body posture is open, and they’ve got their notepad and their pen at the ready, to scribble down any words of wisdom, ideas, or other gems of information that they can take back to their businesses and use. However, not all agents are ready to learn. Some agents sit there, arms folded, expressions folded, their minds closed, and written on their forehead is “I’ve heard it all before”. These are the ones who tell me “there are no new ideas”. Really? Tell that to James Dyson, and Steve Jobs, and Richard Branson. Even if it were true that there are no new ideas, there are always new connections to find between existing ideas. And that is sometimes how the best ideas are formed. 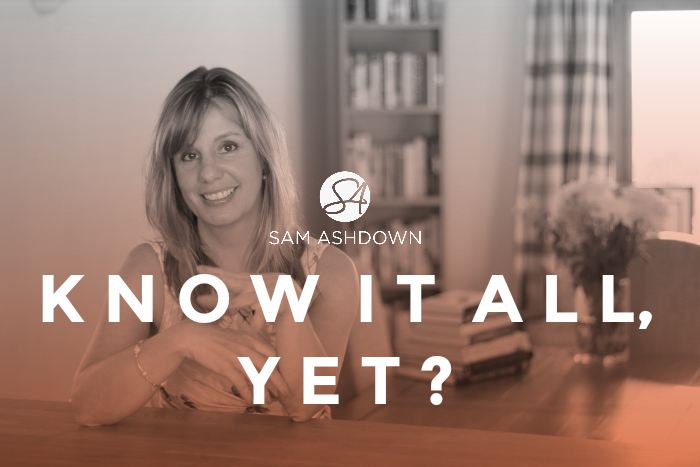 If you attend my training sessions, listen to me present, or read my blog, and you do so with a closed mind, what new information or concepts could you be missing out on? Last year I was delivering training down in Kent, on Social Media. Being the hot topic it is, everyone in the room was very interested. There were around 12 tables in the room, full of agents, all eager to discuss, debate and discover all about what Social Media can do for their businesses. Except for one table. On that table sat 8 men of a certain age, and a certain attitude. You see, they knew it all. There’s nothing that this 5’2 bossy northern lass could teach them that they didn’t already know, or that they cared about. Estate agency has to move on. And how else can it move on, but through new innovation, and new ideas? Of course, not every idea will work. I’m not sure 3D floorplans ever really took off; and remember those text codes you sometimes saw on for sale boards? An expensive innovation replaced almost immediately by QR codes, which in themselves, are on their way out, inevitably replaced by augmented reality and other technological wizardry we have yet to see. Technology moves fast, and brings with it new way of doing business and serving our clients better. The agents who embrace it will, of course, sometimes back the wrong horse and waste money, time and resources on something that doesn’t last. But if we don’t give ourselves permission to fail, how can we ever succeed? And that’s the problem with the industry. Estate agents simply don’t like change. Which is ironic really, given that they are helping people through some of the biggest changes they will face in their lives. Yes, change is scary. Sometimes it doesn’t work. But without it, we’ll stagnate, and if we stagnate, our businesses will wither and die. Instead, embrace new ideas. Try things. Experiment, test and measure. Some ideas will work, and work BIG for you. But if you don’t try, it may be your competitor who does. And that breakthrough could be his. Find the nuggets of gold in the ideas amongst your team, by having a brainstorming evening. Recognise and reward their efforts. Have an ideas box in your office. Read blogs like mine and innovative publications like 4i. Subscribe to the best of current trends and thinking like Wired and Hubspot. And perhaps over time you will open your mind to new ideas and concepts that had previously been invisible to you. Some people call me a Social Media expert, and I protest. Not with false modesty, but from the heart. Because Social Media is only seven years old. As a credible marketing tool, it’s really only about three years old. How can anyone be an expert on such an enormous and wide-ranging subject in just three years? Especially when the Social Media landscape changes at least daily. Open your mind, open your attitude to the possibility of change. To a different future. Don’t criticise the new kids on the block, ask yourself what you can learn from them? Don’t be scared to get out of your comfort zone every now and again. If it’s challenging, that’s a good thing. If you’re finding it difficult, you will grow. It’s only through growth that we can realise our potential. So where do you want to be? Who do you want to be? What can you do today that scares you a little? Next post Are you wrestling with Social Media?